The month of May brings with it the end of English domestic football at all levels. League campaigns come to a halt and the showpiece events come to forefront of the public's fascinations. The big games; the league title deciders, the cup finals, the playoffs. They make for an epic climax to a football season. For Oxford City, the season so far has been a phenomenal one. 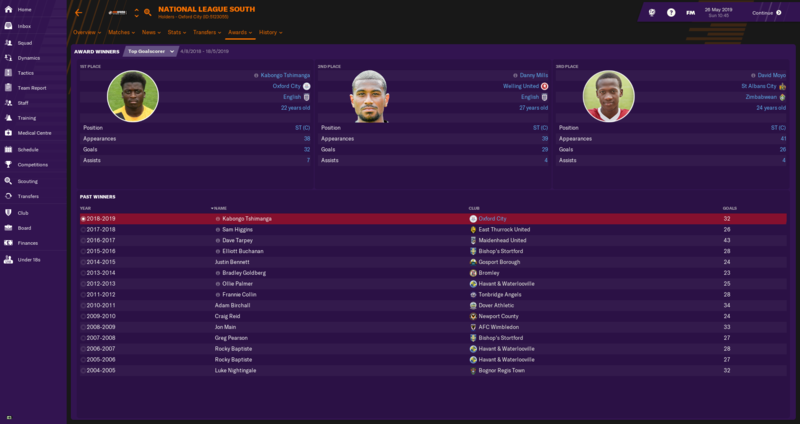 Under the stewardship of young manager Ryan Ferguson, they have secured the Natioal League South title by a five point margin, scoring a phenomenal 109 goals (2.6 per game) in the process. The club had been expected to struggle this season, with financial difficulties casting a shadow of doubt over the short-term and long-term future of the club, but a superb run of form at the beginning of the season snowballed into a colossal year of brilliance for the football club. A ninety-one point haul was more than enough for City to secure an unprecedented National League South title but their run of form in the league has not been the only success on the pitch for the club this season. A sensational run to the Third Round of the FA Cup put the club in the media's spotlight, defeating EFL sides Walsall and Swindon Town on the way. Only EFL Championship side Birmigham City could prove too difficult for Oxford City to overcome. With Oxford City's league campaign finishing up last month, they have just one fixture remaining this season. It is the small matter of the FA Trophy final. 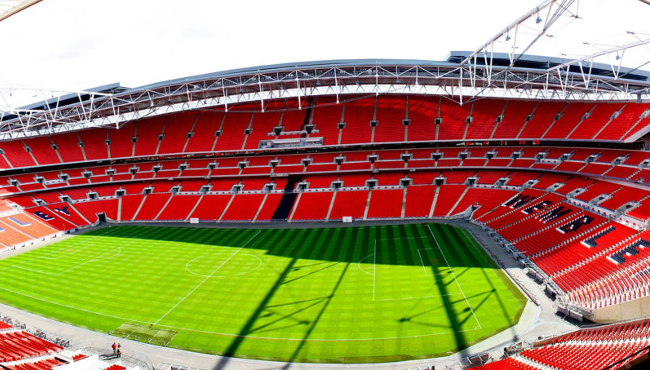 They face National League side Chesterfield tomorrow at Wembley in a game which is set to host over 19,000 fans. Chesterfield had finished second in the National League this season but suffered defeat in the playoffs, condemning them to another season of non-league football. Tomorrow's final marks the first time that either team has reached the final stage of the competition, with Chesterfield having been a part of the English Football League structure since 1899. 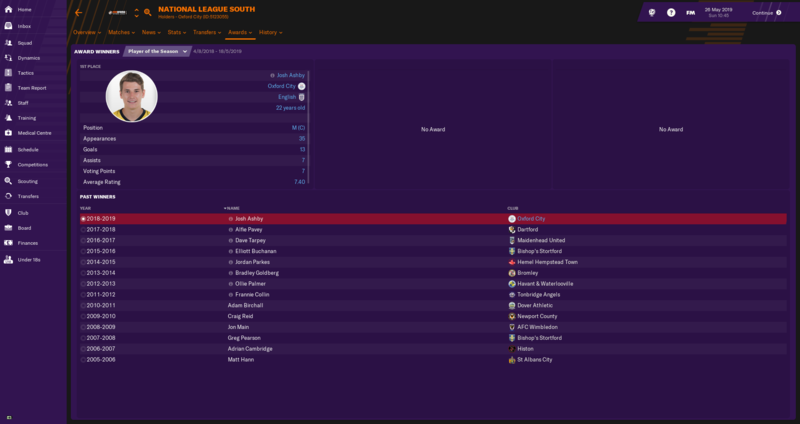 Back-to-back relegations in the previous seasons put Chesterfield in non-league football with an EFL standard squad, making them formidable opposition for any team to play against. Oxford City and Chesterfield go into the game with contrasting emotions. For Oxford City, their league campaign has been a remarkable success, securing the title and moving to the National League. For Chesterfield, their league campaign has been a bitter failure, falling at the last hurdle in the playoffs. Tomorrow's game will be an opportunity for the emotions of the two teams to be expressed on the pitch. Oxford City manager Ryan Ferguson has not allowed his team to celebrate their league success just yet, with one important fixture remaining. The young Liverpool-born gaffer has announced his pride for his players but has warned his stars that they will require every ounce of focus they have to overcome a vastly more experienced Chesterfield side. Chesterfield's wage spend of over £30,000 per week is significantly above Oxford City's of roughly £3,000 per week but Ryan Ferguson has professed that his team's committment to winning trumps any wage spend. "We're excited for tomorrow and we're ready for the challenge we face. It is our first time playing at Wembley and will hopefully not be our last. We look forward to turning out at one of the finest football stadia in the world, competing for a major non-league honour. Victory tomorrow would put a very nice seal on what has been an incredible season for us. We're up against what could possibly be our toughest challenge of the season. They (Chesterfield) are a thoroughly professional team. They haven't had the best of seasons in recent years but we have to remember the heights which they have reached in the recent past and the professionalism with which their players conduct themselves. They will be an incredibly difficult side to play against. We've had a wonderful season to date and we have a lot to celebrate. I don't think anybody anticipated that we would win the league but we played out of our skins and we deserved our title success. We won't celebrate that just yet though, we still have one more game to play. We'll let ourselves relax and celebrate after tomorrow, regardless of the result. They (Chesterfield) have a superior wage spend to us. They're still working on a professional budget, as opposed to our semi-professional budget. But money isn't the superior factor in football. The commitment and endeavour of our football team will match their money on the pitch tomorrow. It will be difficult but we will put them to the test." ScottT, Chesterfield will prove to be an incredibly difficult challenge, I have absolutely no doubt about that! Hopefully we can make our own bit of history & tradition in the final. Looking forward to what promises to be an absolutely fantastic final. Two very different clubs, but who knows what the result may be! Just a day after Chelsea lifted the FA Cup with victory over Bournemouth at Wembley, another cup final was showcased at the English national stadium. It wasn't quite the showpiece event with the same media and public attention as what came a day before, but it was an important final in English football, for sure. It was the small matter of the FA Trophy final; a competition containing teams from outside the English Football League (top four tiers). Newly crowned National League South champions Oxford City were the victors, with a 3-2 victory over National League runners-up Chesterfield. City looked to be in for a comfortable victory, scoring three unanswered goals in the first half but Chesterfield struck twice in the second half in a desperate attempt to find a way back into the game, but to no avail. 19,331 fans attended the game at Wembley, with just 2,001 of those being Oxford City fans. The odds were shared similarly to the attendance; Chesterfield were big favourites to win. The Spireites had recently suffered back-to-back relegations from the EFL League One and, despite finishing second in the National League this season, capitulated in the promotion playoffs this season. The failed expectations of Chesterfield this season were of great contrast to the upturn in fortunes for Oxford City. 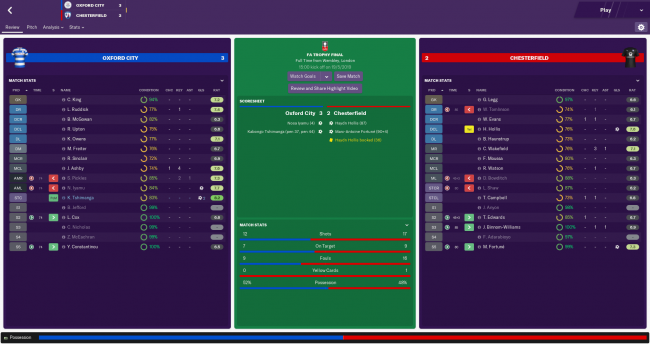 Under the stewardship of young budding manager Ryan Ferguson, Oxford City have soared away from financial difficulty and completed an incredible feat as they secured the National League South title. Oxford City's attacking form throughout the season has come under incredible praise, with the side scoring 138 goals in 56 games (2.46 per game) in all competitions before the FA Trophy final. City showed their attacking prowess in the opening stages of the game as they scored the opening goal, with just 192 seconds played. Oxford moved the ball from left to right, with Sam Pickle's back post cross turned in by the marauding Nosa Iyamu with a delicately placed header. It was very nearly a goal apiece as Chesterfield looked to force a way back into the game just minutes later. Charlie Wakefield's curled cross was met by the head of Dean Bowditch in Oxford's box, but 'keeper Craig King was alert to make a smart stop to deny the much-fancied team a goal. Craig King had to be at his very best if Oxford City were to have any chance of winning, and he was on the top of his game in the first half. He was kept busy as Lee Shaw and Tyrese Campbell put him to the test, with the latter seeing his low driven effort tipped onto the frame of the goal by Oxford City's shot stopper. Teenage winger Sam Pickles was having a fantastic game for Oxford City. In just his fourteenth senior appearance since making his senior debut in February, the youngster had been in incredible form. Just after the half-hour mark, Pickles was felled in the Chesterfield penalty area to earn Oxford City a penalty. Up stepped Kabongo Tshimanga, who smashed the ball beyond George Legg in the Chesterfield goal to double Oxford City's lead, and secure his 45th goal of the season. With minutes to go in the first half, Oxford City had earned their second penalty of the game. Kabongo Tshimanga was making a nuisance of himself in Chesterfield's box, and was brought down by an over-eager Haydn Hollis. 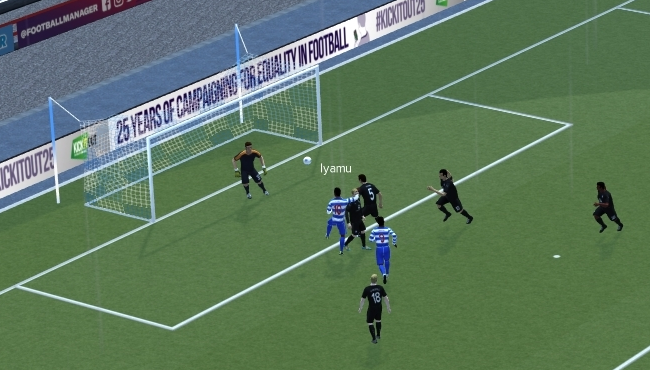 Tshimanga stepped up and calmly placed the ball down the middle of the goal, giving Oxford City an incredible three goal lead. The exertions of a long season took its toll on Oxford City in the second half as Chesterfield began to dominate. 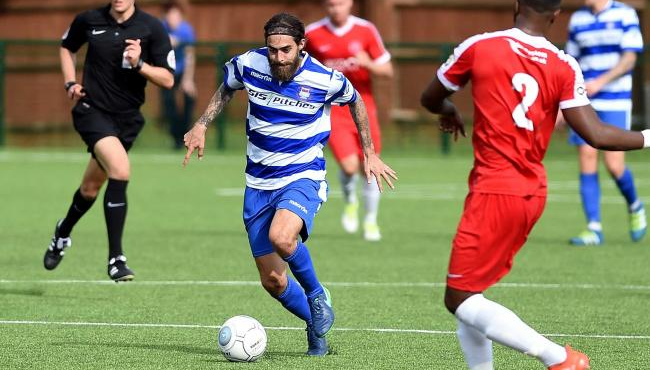 The National League second placed team looked to force a way back into the game and tested Craig King in Oxford City's goal several times throughout the second game. With very little energy left in the players' legs, Oxford City changed to a five-at-the-back formation, conceding ground in midfield in an attempt to protect the last line of defence. However, it was only a matter of time before Chesterfield would score. Chesterfield's first goal came with less than four minutes remaining. Defender Haydn Hollins rose highest in the box to convert a corner. It was a goal which opened the game back up for Chesterfield, and they pressed for more. As the game edged into additional time, veteran striker Marc-Antoine Fortuné put Chesterfield within touching distance as he powered a header into the top corner of Oxford City's goal, with little time remaining. With two minutes remaining in added time, Oxford City held on for dear life. They fought valiantly to keep Chesterfield out and the full-time whistle blew, to the jubilation of the Oxford City supporters. Oxford City had won the cup! "I am thoroughly delighted with what we achieved today! We came up against a very strong team in Chesterfield who put us to the test right until the end. It was a very difficult challenge but we have earned the trophy which has put a fantastic finish on what has been a fantastic season for this football club. I am immensely proud of my players. They have worked hard every single day and today was no different. We got the goals we needed and while we conceded twice, we defended well enough to keep Chesterfield from equalising against us. We had some tired legs going into the second half. The effort we put into the first half took a lot out of us. 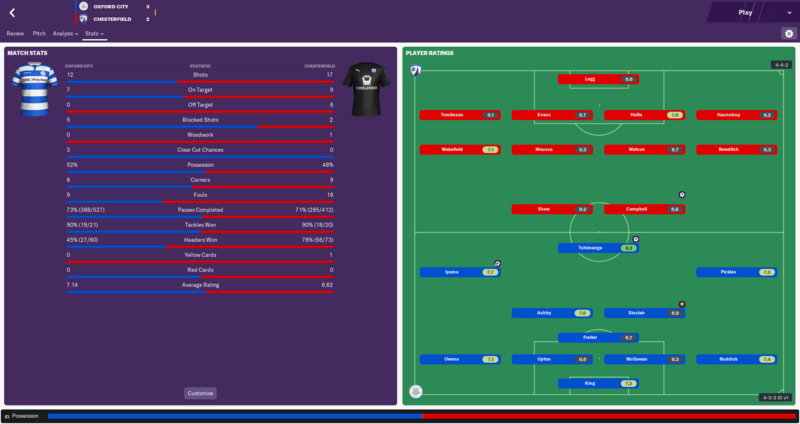 The second half was all about game management which we did well until the final five minutes. The final few minutes were difficult to watch but we did enough in the game to win a deserve cup trophy." "I think its a real shame that we didn't win today. We worked hard to be here and it isn't nice to lose a cup final. We've had a couple of difficult seasons recently and this really puts the nail in the coffin for us. We thought that a cup victory would make up for not earning promotion back to the Football League. We have to credit Oxford City. They obliterated us in the first half with their attacking movement and pace of passing. We couldn't keep up with them and we were chasing circles. They scored the goals which was enough in the end and they deserved the cup victory. We had to fight to score and we got two goals but it was too little too late. Oxford City made us work very hard for the goals but I can only be disappointed that we didn't do it earlier. I'm disappointed with my team. They're a bunch of useless *******." The season is over for both teams. For Chesterfield, the runners-up will face another season of football in the National League. Martin Allen is likely to be sacked after failing to secure either promotion or a trophy, with a number of players looking to leave the club when their contracts expire at the end of June. Oxford City will be playing in the National League next season, their first time ever in as high a tier of football. They will be up against the odds of surviving but with young and enthusiastic manager Ryan Ferguson in charge, anything is possible for City. ScottT, a win for Oxford City, of course! Brilliant result and a great way to end the season. Incredible achievement! Well done Ryan and Oxford City! Rob, the FA Trophy final was two days ago and the celebratory parade took place yesterday with both the FA Trophy and National League South titles on display. Firstly, congratulations. Secondly, what are your feelings about what has been a truly remarkable season for the football club? RS: I'm over the moon, personally! We were expecting a difficult and challenging season but the new gaffer came in during the summer and gave us all a new lease of life which has seen us prosper on the football pitch. We've been playing out of our skins and I don't think any one of us could have anticipated the kind of success we have had. This season has been the club's greatest ever and we are all very proud of what we have achieved this year. You spoke of the manager, RYan Ferguson, and of how he had an impact since he arrived last summer. What exactly has he changed in his time at the club to date? RS: His experience as a youth team coach at Liverpool Football Club has been of great benefit to us, I believe. We have quite a young squad, with me being one of the oldies, and he has helped to mold them into players with the ability which this club deserves to have. He has helped us players to evolve on the pitch, and to evolve as human beings. He's instilled in us the values of a proper football culture and we're all better off for it. Maidstone United, Walsall, Swindon Town, Birmingham City and Chesterfield. In seven games against these clubs from higher divisions, Oxford City had a record of 5-1-1. That is truly remarkable. How has such a record been achieved? RS: I think a large part of it has to go down to how we train on a day-to-day basis. The gaffer came from a playing and coaching background at one of the world's top football clubs and he has implemented the same training standards on us. We put particular focus on moving the ball around quickly and in tight spaces to emulate how the top teams give you very little space on the ball. This has been of enormous benefit in preparing us against any big challenge we have faced. The result against Birmingham City was, arguably, an unfair reflection of the standard of performances in that game. We played a good game against them at St. Andrews and, on another day, could have bagged a couple of goals. Our training methods have certainly pushed us to play at a higher level than perhaps we should be playing at and our results throughout the season have been just-rewards for our daily endeavors. In previous seasons you have played in a more advanced role. This season, you have been primarily playing as a deep lying playmaker. What was the thinking behind this switch in role? RS: It was what the gaffer envisaged for me at the beginning of the season. He sat me down and we discussed ways of developing my style of play for the future. We talked about what my strengths are and what my weaknesses are and we decided that it would be beneficial to put me in a role where I could provide my skills to the team effectively. We had a look at a few players who played in a similar role in the past, including Danny Murphy. Murphy was at Liverpool while Fergie was a youth player at the club and Fergie has access to the video archives of the club. We analysed how Danny Murphy played his game and how he worked with a young Steven Gerrard in the squad. We decided to incorporate similar philosophies from Murphy's game, and we are lucky to have Josh (Ashby) at the club who was a perfect fit for the all-action box-to-box midfield role that Gerrard often played at the time. It all seemed to fit together quite well. I can still get forward into advanced positions when the time is right but the most important thing about learning to play in this role is to become more tactically disciplined. I need to be in a position where I can be effective at all times which means I have to play a little bit deeper than I have before. It has been a learning curve but I think it has made me a better player for it. Speaking of Josh Ashby, he captained Oxford City this season but his contract is set to expire at the end of June. How important is it to keep him at the club? RB: He's a phenomenal footballer. At twenty-three years old he's arguably one of the best players outside of the Football League. He lead us with distinction and class throughout the season and his contribution at both ends of the pitch has been first-class. I think he has hit double figures in both goals and assists, which just exemplifies his qualities. He's a top player and a top man and we'd be much worse off without him in our ranks. Another player who has lit up the show this season for Oxford City is one Kabongo Tshimanga, who scored forty-six goals in all competitions. It must be an incredible confidence boost to have a striker who can find the back of the net with such regularity. RB: Absolutely. Kabongo is a player who has always pushed himself to reach new heights and he has come up with the goods for us so often this season. He scored two very important penalties for us in the FA Trophy final to win the game for us and he seems to thrive under the pressure. He's still a young lad and don't think we've seen the best of him just yet. He'll be an important player for us for years to come. Of course, you have chipped in with a few goals this season too. Eight goals in all competitions this season, which one was your favourite? RB: Was it that many? That's not too bad, is it! I enjoyed every goal but I think my favourite was against St. Albans City in January. I remember getting the ball on the edge of the area before moving into the box and shooting across goal with power. It was probably my best goal and it got us an important three points. Last question, Rob. What are the expectations for next season? RB: I think we've proven this season that we can play with the big buys of non-league football. We have some very good players in our ranks and I have a sneaky feeling we might upset the apple cart a bit. The initial objective will always be to get as many points on the board as possible but I'm an optimistic man and I think we can make a title push again. 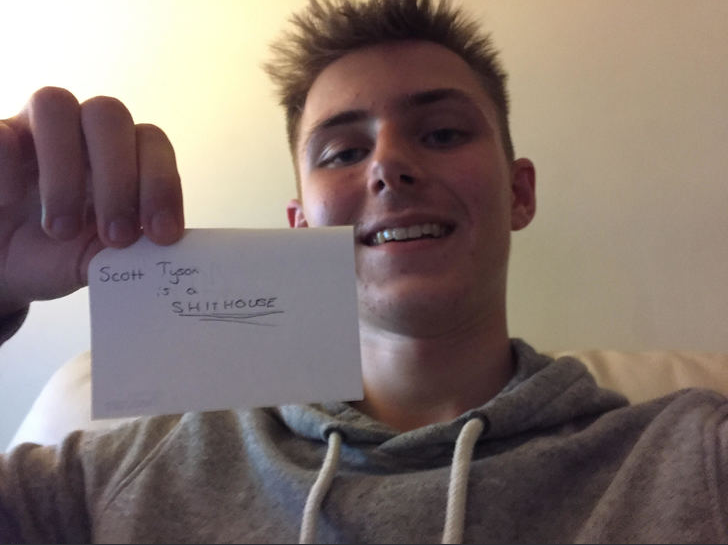 ScottT, yes indeed! Hopefully we'll start next season in similar form! A great interview with Rob there. He's very ambitious for next season; but has every right to be given how successful this season was. If you do managed back-to-back promotions, it would be fantastic! Great interview and great post mate! Things looking very good both on and off the pitch and the players seem to be enjoying life at the club! Just a day after lifting the FA Trophy, Oxford City Football Club announced plans to renovate their current stadium with a capacity expansion. The expansion will consist of an increased capacity by 1,500 (500 seated & 1,000 standing), taking the total capacity of Court Place Farm to 4,500 (950 seated & 3,550 standing). The club secured a loan of £362,457 from HSBC Bank, repayable over a ten year period with an interest of 5.357%. This would equate to monthly payments of approximately £3,100. The club's owner, Brian Cox, also invested £362,250 to the cause, free of charge. 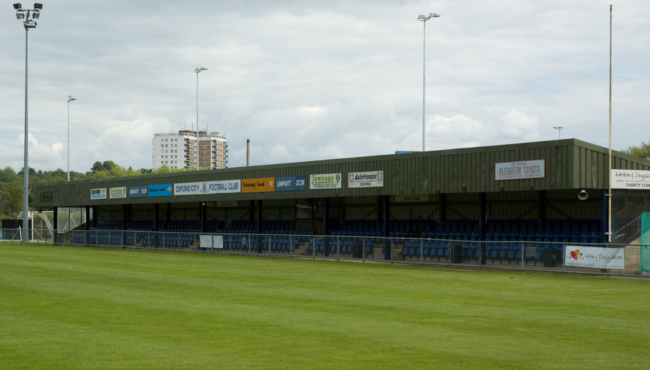 A total of approximately £725,000 was invested, overall, into the expansion of the stadium. The expansion will occurs in the north and south stands, which will spread to cover the majority of the pitch length. The expanded stands will be roofed to protect supporters from adverse weather conditions. The additional 500 seats will be located in the north stand. The stadium expansion is expected to be completed and ready for action by the middle of March of next year (13/03/2020). In the meantime, Oxford City will play their football at Kassam Stadium, the home of Oxford United Football Club. Kassam Stadium has a capacity of 12,205, a significant upgrade on what Oxford City had been hosted by in the past. Oxford City chairman Brian Cox has spoken of the expansion to Court Place Farm. The avid chairman spoke of his delight and of his endeavor to see the club climb to further new heights. "This is fantastic news for the football club. We are all thoroughly delighted to have the opportunity to develop our ground to have the capacity for more football fans. We have worked tirelessly to make sure this expansion can happen without any risk and we are confident that the new expanded stadium will be a major boost to our football club. We are fortunate enough to be able to play at Kassam Stadium for the next ten months, while Court Place Farm is under works. We know it is not our home but the magnificent fans of our football club will always make us feel at home, wherever we play. Hopefully we can have continued success at Kassam Stadium. This expansion is a big step forward for our football club. Most importantly, it will see us meet the stadium regulations for the National League and it is also very close to the regulations for League Two, should we get promotion to there. We will be able to expand our stadium further if required and we look forward to our future here at Court Place Farm." mgriffin2012, things are looking quite rosy, time to push on and aim for higher heights! A step in the right direction infrastructure wise for the club. It's a shame that the renovations therefore stop the club from playing their games therefore the foreseeable future. However, the Kassam isn't a million miles away and won't hinder the fans too much, which is helpful. Although it isn't your permanent home, the much larger capacity will certainly help facilitate larger away supports in the National League and could benefit the club. Will the temporary move to the Kassam affect attendances and gate receipts for the near future? 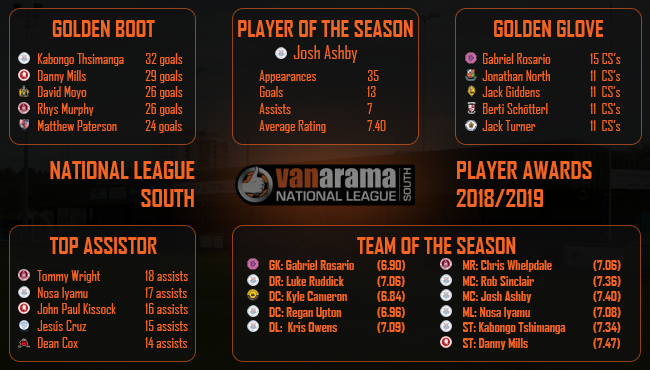 With the season coming to an end, it had become time to announce the best performers of the National League South since last August. Oxford City had been crowned champions, but which players and managers impressed the most? Let's have a look now. Manager - Ryan Ferguson (Oxford City): It was no surprise to see the Oxford City manager scoop up the Manager of the Season award. 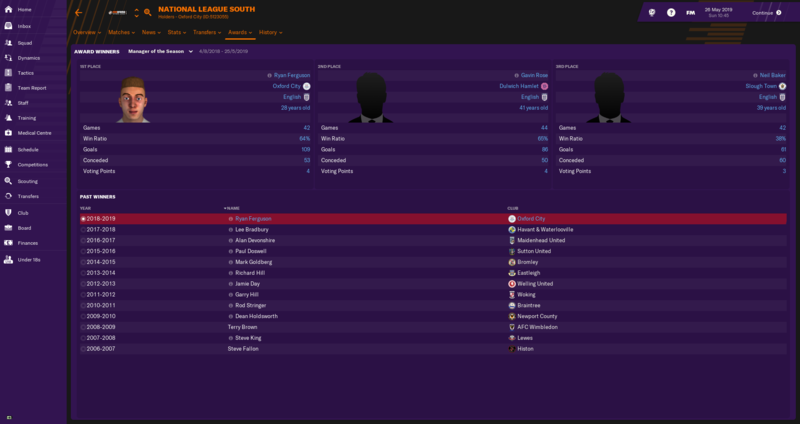 Ryan Ferguson lead his side to an unexpected league title in his debut season in senior management. 109 goals and a 64% win rate exemplified his excellence over the past season. GK - Gabriel Rosario (Dulwich Hamlet): The Dulwich Hamlet shot stopper was the best keeper in the league in the past season. Rosario kept a league high fifteen clean sheets in an impressive season which saw Dulwich just miss out on the league title. DR - Luke Ruddick (Oxford City): The first representative of the league champions, and not a bad one either. Ruddick proved to be a formidable presence at full back for City, providing eight assists for his team mates throughout a solid season for the Englishman. DC - Kyle Cameron (Torquay United): It was a remarkable debut season in the National League South for the young Scottish defender. The 191cm powerhouse was a rock at the back for Torquay United, and could rarely be displaced from the first team. DC - Regan Upton (Oxford City): The former Wolverhampton Wanderers youth had a very good season at the back for Oxford City. Upton participated in all but two fixtures for City in the league this season, scoring three times. His aerial presence made him formidable in both boxes. DL - Kris Owens (Oxford City): The former Liverpool youngster burst into life for Oxford City this season. He played second fiddle to Ben Jefford at the beginning of the season but broke into the first team and his defensive prowess kept him in the starting lineup. MR - Chris Whelpdale (Chelmsford City): The veteran winger starred for Chelmsford City this season. He scored an impressive thirteen goals from the wing, assisting ten times. His debut season for Chelmsford City was an incredible one. 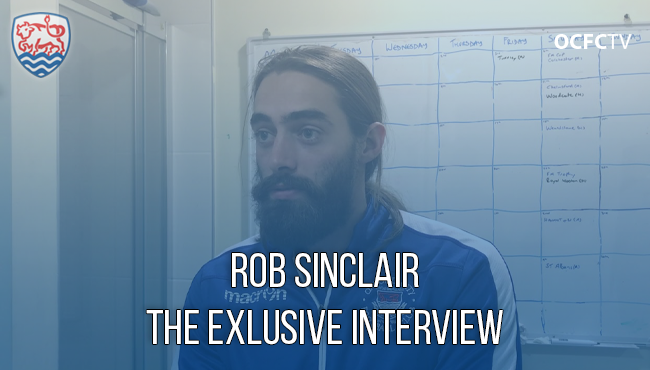 MC - Rob Sinclair (Oxford City): The man with the beautiful beard. He played in a deep playmaker role for Oxford City this season to great effect. He controlled the play in every game, scoring four times and assisting nine times. The experienced midfield maestro was key to Oxford City's successu. MC - Josh Ashby (Oxford City): Josh Ashby was the league's player of the season, and deservedly so. Thirteen goals and seven assists as a box to box midfielder exemplified his attacking prowess, while his ability as a captain showed with his team winning the competition. ML - Nosa Iyamu (Oxford City): Nosa Iyamu made quite the impact since joining Oxford City in the summer. He played the majority of the season on the right wing but switched to the left wing towards the end of the season, with great effect. The tricky winger scored eight goals and provided seventeen assists in a remarkable debut season for the club. ST - Kabongo Tshimanga (Oxford City): What a season it has been for Oxford City's Kabongo Tshimanga. The Congo-born striker picked up the golden boot with thirty-two goals and assisted seven times in a remarkable season. ST - Danny Mills (Welling United): The pacey English striker was on loan from Ebbsfleet United and had a brilliant season for Welling United. Twenty-nine goals four assists was enough for Danny Mills to be included in the (unofficial) team of the season. ScottT, overall I'd be very happy with the temporary switch. A stadium expansion was required anyway so it isn't like we could have avoided it. We'll just have to make the most of having a multi-thousand capacity stadium at our fingertips! mgriffin2012, hopefully in a positive sense. It is a significantly bigger stadium but I do suppose there's no place like home. Hopefully we can fill it out a bit more than we could have filled out Court Place Farm! Not at all surprised to see a number of Oxford City players feature in the team of the season, as well as the manager receiving an award. It's fully deserved after an incredible season. The only improvement needed is in the goalkeeping department, where you don't feature inside the top five. But that's very harsh criticism after the season you've had. I trust the manager to make the right moves in the summer, nonetheless. Incredible season, and with the little previews you're giving in General Chat you're looking pretty set for next season as well! Up the City!